The 38.4 metre Tansu motor yacht Highlight, formerly known as Project LTS, has been spotted on sea trials following her launch last month. The Turkish yard reports that she achieved a top speed of 16.1 knots off the coast of Tuzla. Styled inside and out by yard founder Riza Tansu, this semi-displacement motor yacht features naval architecture by Dutch studio Diana Yacht Design. 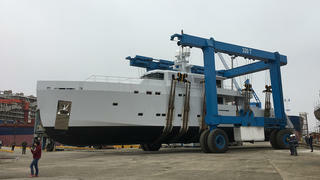 Delivery is due for the end of March, pending a successful conclusion to her sea trials. As the picture above shows, Highlight has been given a sleek, modern exterior profile, with an almost vertical prow and numerous rectangular portholes. Accommodation is for 12 guests split across six staterooms including a main deck owner’s cabin and an upper deck VIP suite. Two doubles and two twin cabins below decks complete the layout of the guest areas. Meanwhile, the crew quarters has been designed to accommodate a total staff of up to five people. Power comes from a pair of Caterpillar C18 ACERT diesel engines, which propel Highlight to her optimum cruising speed of 14 knots. Further details are being kept under wraps for now, but it is understood that this tri-deck motor yacht features a maximum beam of 7.5 metres, while the draught is believed to be 1.8 metres. 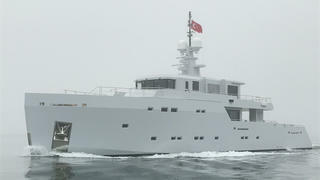 Other superyacht projects currently under development at the Istanbul-based yard include the 39.1 metre Echo-R, the 43.7 metre Project Cyclone and the 44 metre Orca, all of which are due to hit the water before the end of the year. Three further yachts measuring between 37 and 49 metres LOA complete Tansu Yachts’ impressive order book.